The two homes that were severely damaged last February when sinkholes opened up along McLawren Terrace in the Village of Calumet Grove have been sold. Deep cracks were evident in Villager Doris Morrill’s house at 17092 McLawren Terrace in Calumet Grove. And once it’s all said and done and the needed fixes to the sinkhole-ravaged properties are taken care of, the homes’ new owners, Hayden Wrobel Asset Trust Holdings LLC, apparently plan to repair them and put them back on the market. But before that can happen, much-needed repairs must be made to the properties, as well as the roadway in front of the damaged homes and a stormwater pipe running between them. And while that might finally be taking place six to nine months down the road, it’s the kind of news frustrated residents of the neighborhood and Community Development District 4 officials have been waiting to hear. Frank Neumann, whose Calumet Grove home was damaged by sinkholes in February, was busy surveying the area after a second round of sinkholes hit in May. District Manager Richard Baier, who said he’s “cautiously optimistic,” and his colleagues recently met with the new owners of the damaged homes. 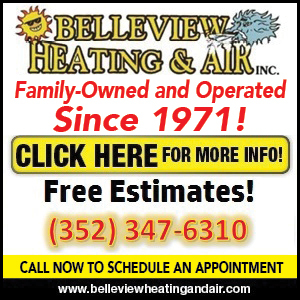 Baier said he was happy to see that the asset holdings company had brought on two new contractors to make repairs to the properties – one that deals with chemical and physical grouting and another that specializes in rights of way repair, including pavement and utilities. Baier said the hope moving forward is that the District can work out a deal with the same contractors to get the damaged portion of McLawren Terrace in front of the two homes repaired, as well as the stormwater drain pipe running between them. “The issue is going to be, can we work out a multi-party agreement and then a separate contract with the District only in the stormwater easement and in the right of way,” he said. Villager Doris Morrill’s Villages home on McLawren Terrace was owned by an estate. Baier said one of the damaged homes on the unstable lots already has had underpinning work done on it, with the other structure to follow suit very soon. Doris Morrill’s abandoned lot quickly became overgrown after she was forced to leave her house last February when sinkholes opened up. Baier said that would involve having the District’s engineer work alongside the contractors. And he added that it will be essential to secure the walls of the two homes so that it’s safe to work on the damaged stormwater drain pipe. Baier said CDD 4 only will be paying for the portion of work involving the roadway and the 42-inch, reinforced spun-aluminum outfall pipe. “We budgeted $900,000 for that work,” he said. “And we’ve already expended $200,000. A crew was on the scene last February evaluating the homes on McLawren Terrace. Marion County Property Appraiser records show that the severely damaged home at 17092 McLawren Terr. was sold to Trinity Management Group LLC on Oct. 17 for $30,000. Five days later, the current owner, Asset Trust Holdings LLC, purchased the home for $85,000. It originally had been owned by the Doris D. Morrill Living Trust, with Morrill living in the home that she and her late husband, Alan, purchased for their retirement years in The Villages. Marion County records also show that the home at 17086 McLawren Terr., formerly owned by Frank and Jan Neumann, was purchased on Jan. 15 for $70,000 by the asset holding company. The sinkholes that have plagued the residents along McLawren Terrace first opened up on the morning of Feb. 15, with Morrill actually having to be rescued from her home. One of the holes outside the door of the Neumann’s lanai was about 35 feet deep. Work trucks sit behind two sinkhole-damaged homes on McLawren Terrace in December as crews continue to make repairs to a troublesome retention pond on the Torri Pines Nine of Nancy Lopez Legacy Golf Course. 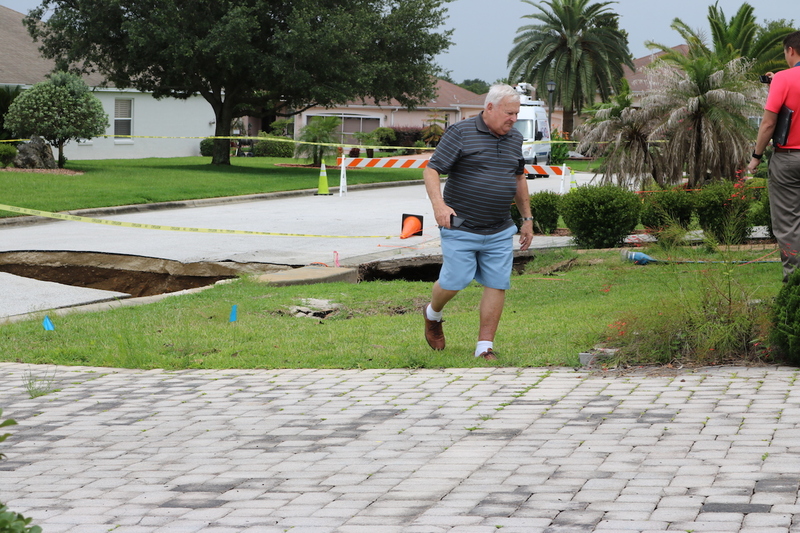 A second round of sinkholes hit the neighborhood in May, which left the portion of McLawren Terrace in front of the homes with a large chunk of collapsed pavement. Two other sinkholes opened up in the yards and a fourth re-opened underneath the adjoining lake on the golf course behind the homes at Lopez Legacy Country Club. Since that time, frazzled residents of the shaken neighborhood have worried about their property values dropping, with one saying a real estate agent advised her to “not even bother” attempting to sell her house any time soon. A pipe where a sinkhole opened up earlier this year in the Village of Calumet Grove was viewed with concern by residents. And many of those same residents were enraged in December when the Neumanns requested an extension from the Marion County Code Enforcement Board to get their property stabilized and begin making repairs to the residence. The Code Enforcement Board refused to hear from both Calumet Grove residents and District officials who opposed the extension on the grounds that the sinkhole-damaged home was creating a public safety issue in the neighborhood.